While a large part of our programs are centered around the process behind the creation of a book, we also do several programs where student work is not published in anthologies, but is instead celebrated in other ways. This year, twelfth graders at DeWitt Clinton High School read author Amy Waldman’s book The Submission, a novel about an anonymous contest to design a memorial at Ground Zero, and the uproar of journalists and politicians when they learn that a Muslim architect wins. The book helped the students answer the question, “How do you decide how to memorialize an event?” which was an important part of their curriculum. After reading the novel, the students held an ethical discussion with Amy, which included questions about why she chose to write the book and how she came about its topic. Then, the students visited the 9/11 Tribute Center. On their visit, the students learned a lot about what it takes to build a memorial, and how architects go about constructing them. They learned about writing memorial proposals, and then they were tasked with composing their own 750-word proposals to commemorate an event in history of their choice. 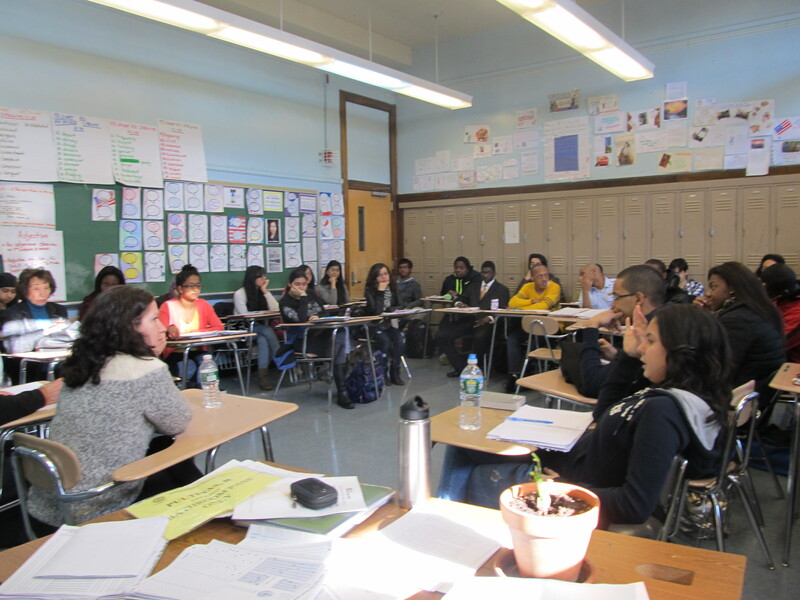 BtB organized a group of DeWitt Clinton alumni to volunteer in the classroom to aid students in revising their works, and discuss their projects’ merits and strengths. The students were highly appreciative of the alums’ visit. When they finished their work, the students presented their proposals to the class. Overall, the project emphasized the significance of history, writing prowess, and public speaking skills, all of which the DeWitt seniors will continue to build upon in the future. Even though they did not produce a published book, the seniors at DeWitt Clinton High School were still able to develop a deep appreciation for books, authors, and writing. They were able to sharpen their skills and build mastery experience, which is invaluable to a reader’s self-confidence level. After the students had finished their work, their teacher, Mr. Ray Pultinas, submitted his lesson plan and the work his students had done during the Behind the Book program to the 9/11 Tribute Center, and he won their Teacher Award for helping create an exemplary educational project that sustained the memory of the 9/11 attacks. The students’ work was definitely a great success! Some of our student books have arrived! From left to right, we have A Search to Ancient Maya: A Time Travel Mystery by Class 501 at PS 76, Remember the Time by Class 4-302 at CS 21, and Third Grade Wonderful Biographies by Classes 3-300 and 3-302, also at PS 76. The fifth graders at PS 76 worked with author Elizabeth Levy to create an awesome time-travel mystery book, complete with beautiful illustrations. They read her book Danger and Diamonds, the magnificent tale of Phillipa, a mystery enthusiast who gets a chance to be her own mystery novel hero. The fourth graders at CS 21 met with author Doreen Rappaport to create thematic biographies. Each student also created a portrait of their biography subject to accompany their writing. They read Ms. Rappaport’s Helen Keller’s Big World: The Life of Helen Keller, which is a thematic biography about the titular character. 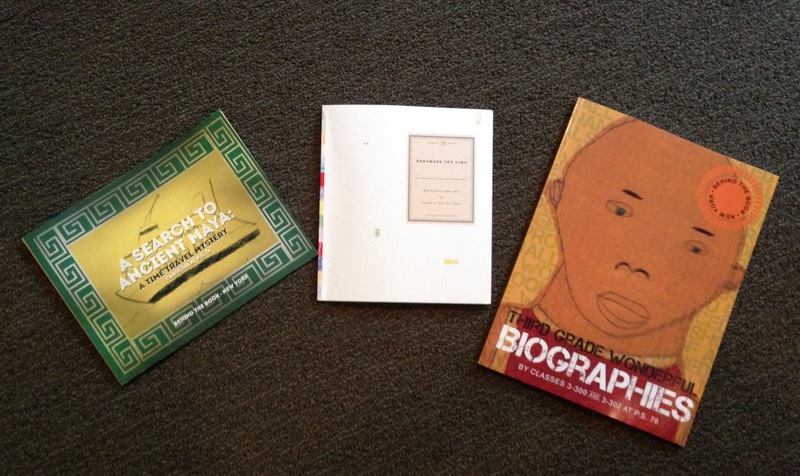 The third graders at PS 76 worked with author Andrea Davis Pinkney to write biographies of their favorite famous people. The students read Ms. Pinkney’s Alvin Ailey, a biography about the titular character, and learned how to decide what is important to include in a biography. There will be more books to come shortly! All of our celebrations take place next week, and we are very excited to share in the fun! If you volunteered with any of our programs and would like to attend your class’s celebration, please contact your program supervisor! Yesterday, our seventh graders from JHS 13 and some parent chaperones visited the African Burial Ground as part of their experience reading Zetta Elliott’s Ship of Souls. In this young adult novel, the main character, D, and his friends Hakeem and Nyla are led across Brooklyn, in a journey steeped in history and suspense, that ends at the African Burial Ground. In a similar journey, our students ventured there with Ms. Elliott to learn about the sacred grounds. Students look on as author Zetta Elliott explains that thousands of African bodies from colonial times lay hidden under Lower Manhattan, the only designated place for people of African descent to be buried at the time. Ms. Elliott also helped boost enthusiasm for the burial ground by imparting her own knowledge. Ms. Elliott’s contributions were definitely informative, and effectively brought the stories of the African slaves to life. In addition to the supplements provided by Ms. Elliott, students interacted with the museum’s educational tools, like informational videos and a barrel on wheels that demonstrated just how physically taxing the slaves’ work was. Two students listen to news coverage about the 1991 activism that led to the reburial of the African remains. One student puts all his might into pushing the barrel up the platform to experience the labor African children did in the 17th and 18th centuries. These tools really helped connect the students and parents with the lives of the slaves. Despite the heat and the somber nature of the stories they heard, the students appeared very engaged and interested in what they were learning. This year, we’ve seen a pretty outstanding crop of college commencement speakers – ranging from author Toni Morrison to President Barack Obama to the Dalai Lama. Every one of them has delivered some piece of incredible advice – but one speaker’s words stuck with us in particular. As Butler states in her speech, we read with the hope that “we [will] lose ourselves in what we read, only to return to ourselves, transformed and part of a more expansive world.” She goes on to say that, through reading, we become better people, more aware of our effect on the world and its effect on us. Reading is a means by which millions upon millions of people can learn more, be more, and think more, and through those processes we can achieve more. While Butler’s statements sweep far and wide, and are generally geared toward an older audience, we agree with her sentiments. In fact, Behind the Book’s main goal, as you all know, is to empower kids to be passionate about reading, to want to read as much as they can, and to give them access to as many books as possible. Eventually, we hope that our students will become scholars and educators, and people with vast and powerful critical thinking skills. We hope our students will take advantage of their chances to read, to learn, and to analyze. And, above all, we hope that they will carry their love of reading throughout their lives. Because Judith Butler is right. Every time you pick up a book, you enter a new world. You are faced with new challenges, other people’s desires, other-worldly societies. Even if what you’re reading is classified as “realistic fiction,” it’s still fiction. Each time you pick up that book, you are still entering a new world, and that ability to transition from your world to the world in your book is invaluable. Reading teaches you how to adapt. Reading teaches you how to put yourself in others’ shoes. And, above all, reading teaches you to be tolerant, and to think before you judge. All of these skills are immensely important to learn – particularly in today’s society, in which everyone seems quick to pass judgment and cut themselves off from a whole world they could have explored. As we embark on the second half of our tenth year, we reflect on the hundreds and hundreds of students we have reached, and we are proud to know that we have, in some capacity, taught them how important reading really is.